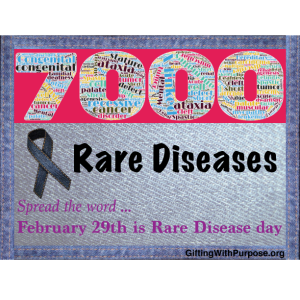 There are over 7,000 Rare Diseases. While each of the 7,000 diseases may be rare, when you add them all up they affect 30 million Americans … 30 million Europeans … 350 million around the globe … 1 of every 10 people have a Rare Disease. Most of the muscular dystrophies are rare … cystic fibrosis is rare … many cancers are rare .. and metachromatic leukodystrophy is very rare, affecting 1 in 40,000 births with 1 in 100 of the general public being a carrier.